Probably the number one Mexican food item that people are familiar with is the taco (tah-co), but as with everything else, one man’s taco is another man’s burrito, or something like that. There are a multitude of taco recipes floating around using either corn or (shudder) flour tortillas, different cooking methods and an equal number of ways to stuff a wild taco. For many folks, the only taco they know about is the fast-food type sold at Taco Bell or many other joints that hawk pseudo-Mexican food. Those of us lucky enough to live in the Southwest have access to countless small taquerias that sell a traditional style of street taco which features two small corn tortillas filled with meat, salsa and cilantro. Add a couple of slices of fresh radish and a spritz of lime and you are, as they say in the East San Gabriel Valley, ‘having things’. For this recipe, I’ll focus on the traditional Tex-Mex taco I grew up with, the same style made famous at Manny’s Chile Bowl (now sadly closed) in Paradise, California: corn tortillas, quick deep-fried and then stuffed with tasty ground beef and veggies. The choice to go ‘hard’ or ‘soft’ totally depends on your personal preference, but these ‘soft’ tacos are WAY BETTER than the ones you get at The Crazy Chicken or places like that, where they use steamed corn tortillas and IT JUST AIN’T THE SAME!!!! My choice is always for ‘soft’ tacos, done a la Manny’s. Short stack of cloth kitchen towels (NOT the good ones! ), deep fryer, medium size frying pan with lid, various wood spoons, cooking tongs, paper towels, a Dos Equis and thee. If you don't have a deep fryer, BUY ONE... they're really inexpensive and you can then make tortilla chips or funnel cakes with it too! See the end of this recipe for my recommendation (hint: Presto Fry Daddy). One (1) dozen fresh (packaged, non-frozen) corn tortillas, ½-lb. Cheddar or Longhorn cheese, vegetable oil, choice of meat (chicken, beef, pork, catfish, wolverine, whatever), lettuce, tomatoes, one (1) can sliced olives, one (1) medium size potato, taco sauce or salsa, fresh avocados if you have them. Note: you can use frozen corn tortillas, which I regularly do. Just pry them apart gently and lay them on a towel on the counter for about 10 minutes, turning them over every so often until they are soft and dry to the touch. They might curl up a bit, but no worries unless they crack and split apart, usually a sign they’ve been in the deep freeze a bit too long. Just make sure they are completely thawed before you drop them in the deep fryer! My kitchen is laid out with a stovetop on my left and sink on my right, with a counter top in between. As I am right-handed, I work from left to right with the cooking and assembly, laying out the utensils with my assembly strategy in mind. I also like to cover the counter area with cloth towels to lessen any spillage mess. Hey, we’re cooking, right? 1. Cook your meat, heh heh heh. Now, this can be as simple or complicated as you wish, but for this recipe I’ll go with ground sirloin, browned in a pan and drained. Once returned to the pan, season to taste, shred half of the potato directly into the meat, fold in and simmer over semi-low heat for around 30 minutes, turning every 5 minutes or so until the potatoes have cooked properly (if you're in a time pinch, leave out the shredded potato). Then drop in a can of sliced olives with the water, season to taste again and continue to simmer while you take a swig o’ cerveza and prepare the other ingredients. 2. Grate the cheese, chop the lettuce (julienne-style) and tomatoes and stash in the fridge. 3. Set up the deep fryer on a covered surface and pour in about 1-inch of vegetable oil. Plug in and heat the oil until a small bit of tortilla dropped in will begin to sizzle and cook immediately. 4. Fold two (2) paper towels bi-fold, then fold two more – these will be used to pat-off any excess oil from the cooked tortillas. 5. Confirm your meat is completely cooked and the potatoes are the right consistency. You’ll note the ‘taters are slightly dry, and that is exactly what we want – NO DRIPPY CACA TACOS!!! 6. Set up the taco makin’ station with your cheese, lettuce, tomatoes, hot sauce and spices. 7. Raise your beer in celebration of the most-excellent tacos you are about to create! 1. Using the cooking tongs, immerse one corn tortilla into the oil, allowing it to cook for 5 to 10 seconds, then flip it over and cook for another 5 to 10 seconds. Cooking time may vary depending on how soft or semi-soft you want the tortilla to be. Once done cooking, grab the tortilla and hold it over the fryer to drain off any excess oil. Use care if the tortilla begins to grow a pocket of hot air while cooking – gently poke a small slit in it with the tongs and it will flatten out, but watch out for the hot oil. 2. Place the cooked and drained tortilla onto the paper towel pad you’ve made, place the other paper towel pad on top and gently press down to soak up any excess oil. This is a very important step and will make or break your tacos. NO DRIPPY CACA TACOS!!! 3. Once patted dry, place the tortilla onto a plate and spoon on a heaping helping of taco meat, likely two spoonfuls or so. Make two more tacos just like this for a plate-full, then transfer the plate over to the makin’ station. 4. This part is TOTALLY FREE-FORM. Add the fixings any way you choose, but here’s my style, in order: shake of salt & pepper, a few drops of Pico Pica (my fave hot sauce), a few slices of avocados, lettuce, tomato, cheese, a bit more pepper and some more hot sauce. My wife likes to put some cheese directly onto the meat so it will melt, but that goes against everything I ever learned about making tacos. Or not… whatever. She IS smarter than me, so there’s that. 5. Repeat this process for each plate of tacos. If you have several people to feed for a sit-down meal, make each set of three tacos on a plate, then place them WITHOUT THE FIXINGS into a 200-degree oven to keep caliente until all the tacos are made and ready to be completed. Natch, be sure to use oven-safe plates! Make a few extras, put them on a plate, cover with a towel and stash in the oven for anyone (everyone?) who wants MORE TACOS. 6. Eat your tacos... drink your beer… make more tacos if needed! Oh yes… this will happen. CHICKEN – this will take a little more advance planning than the ground sirloin. Bake a couple of chicken breasts ahead of time, skin off, dry-seasoned to taste. Once cooked, allow to cool for a bit, then shred the breasts with a fork and place in a small sauce pan over low heat. Simmer while adding your fave hot sauce and season to taste. PORK – also referred to as carnitas (car-nee-tas), the variations for cooking are immense, but cook your pork roast (NOT CHOPS!!) to your liking, then shred or pull apart and simmer like the chicken method. Wait a minute... maybe pork chop tacos would RULE, so cook some up! FISH – I don’t like fish tacos… I don’t cook fish tacos… never ate fish tacos when I was a kid… fish tacos are an abomination! That said, cook your White fish filet any way you like for the taco stuffing and don’t say I didn’t warn you (insert evil Vincent Price-style laugh here). BREAKFAST – of course you can make breakfast tacos! If you’re like us, we can eat brekkie any time of the day or night. Eggs that are fried or scrambled are a natural taco stuffing, then slap some hash browns and cheese in there for good measure. The hard-core taco eaters out there may even want to whip up some huevos y papas con chorizo (scrambled eggs mixed with fried potatos and cooked Mexican chile sausage) and then stuff them in tortillas. ORALE’. VEGGIE – a surprising taco stuffing that uses whole or refried pinto beans instead of meat can be very satisfying. You can also use seasoned fried potatoes or hash browns. Hard taco shells are tricky to make without a wire deep-fry form, but it can be done. Dip the fresh tortilla into the deep fryer and while it’s cooking, grab one side of the tortilla with the tongs, fold over and hold just off the side that’s cooking. After a bit, turn the tortilla over so the other side is now cooking in the oil and hold the first side up… you’ll see what I mean. Keep doing this until the tortilla holds the desired U-shape and is slightly browned around the edges – this means the tortilla will hold its crispy shape. You could also buy those pre-formed shells from the store, but trust me: they sucko mucho. Stove-top soft taco shells are really easy to make if you prefer them to the deep-fried style, and I like to vary between the two from time to time. The best way to make them is with a comal (ko-mal) or cast-iron tortilla griddle, which is essentially a raised flat frying griddle… you can also use a regular frying pan with a slick coating. Place the griddle on the stove-top at medium heat and let sit until a drop of water skitters across the surface. Place the tortilla on the griddle for about 10 seconds, turn over and let cook for another 10 seconds. Repeat this process until the tortilla reaches the color and ‘doneness’ you want, then stuff it. Steamed soft taco shells are typical for fast-food joints and are not my favorite, but will do in a pinch. Take a short stack of corn tortillas, wrap them in a clean kitchen towel, sprinkle the towel with some water and microwave them 20 to 30 seconds, depending on your micro settings. They’ll be smokin’ hot when done, so be careful when removing them from the towel. Flour tortillas were never meant to be used for taco making, but there are SOME PEOPLE who prefer them for reasons of their own (not me!). If your heart is set on making tacos with (shudder) flour tortillas, DO NOT DEEP-FRY THEM as they will turn crispy on contact with the oil and break as soon as you try to bend or fill them. My suggestion is to use the stove-top method on a comal or heated frying pan, cooking them until they begin to fill with hot air bubbles and start to brown. Bizarre tangent – when I was a kid, I would take a flour tortilla and a slice of bologna, put each on a gas stove burner and cook them directly over the flame, turning them a few times until both were cooked/burned/charred, place the bologna on the tortilla, roll it up and hork it down. Always left a HUGE mess on the stove and made my Dad real mad… heh heh heh. Is this a taco or a burrito? Believe me when I tell you: the aroma of a slightly charred flour tortilla and bologna is simply awesome. As with all of my recipes, don’t be discouraged if your first attempt to make tacos doesn’t meet expectations. It just takes a little practice to get the hang of making the meat and frying the tortillas. Having said that, I don’t recommend serving this dish to invited guests unless you’ve already made them a few times for good measure. I’m just sayin’. I strongly suggest investing in a good deep-fryer like the Presto ‘Fry Daddy’, my weapon of choice. As I mentioned in the enchilada recipe from earlier this year, my first deep-fryer endured almost 15 years of regular use before it conked out, and the replacement cost all of $35 from Wal-Mart. A really good investment! Be sure to avoid bargain-brand hot sauces or the really thick and chunky styles unless that’s your bag. As an adult, I simply cannot accept anything less than Pico Pica, something my Dad always had on hand and would put on everything he stuffed in his taco hole. I always thought it tasted awful, but time and temperament have changed my taste buds and it is now the only hot sauce I’ll use. 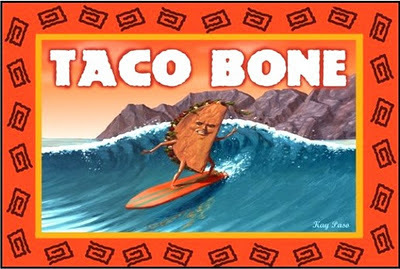 Taco Bone image, muchismas gracias de crunchyroll.com; War 'Nappy Head' video, muchismas gracias de YouTube.